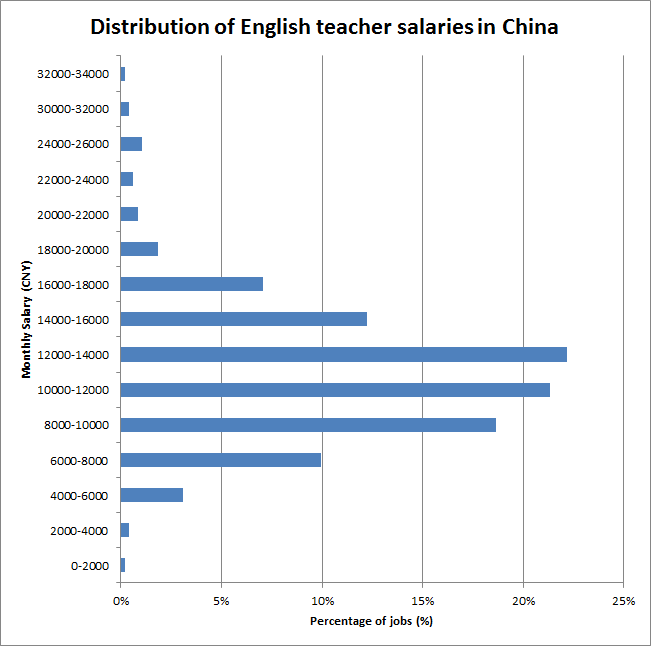 The average salary for teaching English in China is between 8,000 - 14,000 RMB per month ($1,200 to $2,100). The top end of that - 12,000 to 14,000RMB, was typically from private language schools in large cities. In general location makes the biggest difference in salary. The larger tier 1 cities, like Beijing, Shanghai and Guangzhou offered the top end salaries and smaller tier 2 & 3 cities offered the lower ends of the salary band. The very top end numbers are typically from high quality international employers in the large cities like the British Council, who for example pay relatively close to British salaries in multiple different countries or international schools. The bottom end salaries in the jobs we looked at were usually stipends paid on volunteer positions. We also looked at housing benefits as getting housing provided or an accommodation allowance is basically the same as having a higher salary and found roughly 49% of jobs provided an apartment, 15% provided an allowance and the rest left it up to the teacher. To calculate these numbers we examined all the jobs posted on teflSearch from the past year for China. You can see the full percentage breakdown and a lovely graph below. If you want to know how that salary actually breaks down in practice and what you're have left over each month, we put together a full breakdown of the costs including tax, housing, airfare etc. in our Chinese cost of living calculator.